Brick Repair Denver is like the Rolls-Royce of masonry. We are ​not your typical (read: sloppy, sketchy, late-arriving, penny-pinching, half-baked, couldn't-care-less-about-fixing-you’re-old-brick-wall) masonry company. Nope! Whether you’re a Denver home or business owner, property manager, or a contractor… when you hire us? We’re NOT just another brick in the wall company. ​Let me ask you a quick question: do you remember the story about The Three Little Pigs? In the story, the big bad wolf blows down the first two pigs' houses, made of straw and sticks so effortlessly, but is unable to destroy the third pig's house, made of bricks! ​-​That's right... c'mon sing it! “Ow, she's a brick house… yeah, she’s the one, the only one, built like an amazon"... LOL! Okay, hopefully you got the song reference and a laugh. Obviously no one in Denver makes their house out of straw and sticks anymore, unless of course... you're livin' out in the sticks. ​Over time, brick can start chipping, cracking and crumble off in chunks or even break away completely from your Denver home or building. Go here to read our reviews and see what customers are sayin' on ol' Google about Brick Repair Denver! We love kids. Their great little helpers. 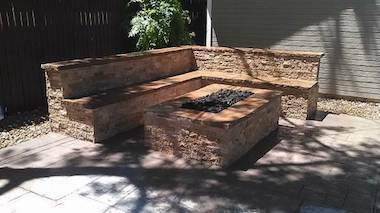 Our Denver brick mason's understand repairing brick better than anybody in Colorado. Like Doctor's, they've got their Pee-h-Dee in Denver masonry repair. Brick is an all-natural and highly-durable building material from the earth. Brick homes and buildings from the 1800's are still standing all over the Denver metro area… talk about long lasting! ​But you could prob’ly care less. So let’s talk about you. You’ve got an older Denver home or building. That has an old brick wall. And something’s up with it. Amiright? Maybe it's cracking or crumbling and starting to make a sopping mess. Maybe it's old and dirty. Or maybe it's just time for a new look altogether. As Denver's top masonry repair contractor, we utilize meticulously crafted methods that include removal and replacing broken and loose bricks in a wall, and expertly engineered new masonry construction to treat a host of brick problems big or small. 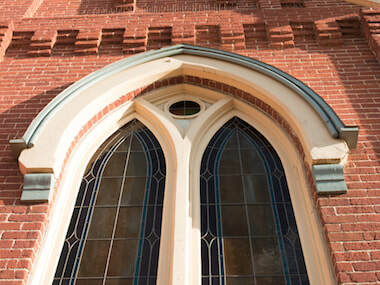 Here in good ol’ Denver Colorado, brick restoration is one of the many areas we specialize in. We like to use a combination of time-honored craftsmanship along with state-of-the-art technology to make sure your new or old brick home looks great and stays in immaculate condition. We're not satisfied until you are. We're brick repair pro's and it's our job to help you. Let us help keep the charm alive in your Denver home or business! ​​Get a free quote NOW by calling (720) 445-9474 today! ​We've been doing this for almost 30 years and take great pride in serving the good people of Aurora, Arvada, Englewood, Littleton, Lakewood, and the nearby Denver, CO metro area. You can also scope out our customer reviews section to see how damn happy they really are. Depending on where you live, lot’s of Colorado natives and "transplants" are drawn to the hippest, freshest, drop-dead cool, and hottest historic neighborhoods in Denver. Whether you live in Highland, LoHi, Jefferson Park, Sunnyside, Berkeley, Baker, Whittier, LoDo, Five Points, Uptown, Park Hill, Capital Hill, Cheeseman Park, Hilltop, Crestmoor, Congress Park, Mayfiar, Washington Park, The Golden Triangle, RiNo District, Downtown Denver or any other diverse neighborhood's in the Mile High City... we're here to help you! Let's be real, a dirty old brick home or building in Denver that is not maintained, no matter how stunning the original architecture may be... looks like a plate of microwaved eyeballs that needs to be repaired. Bad! Loose bricks are a common problem with older homes throughout Denver, Colorado and you must fix them now or you’ll be redoing more brick repairs on your home, that'll make your head spin. 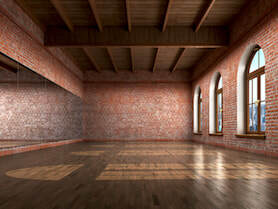 Like most of our clients, who love the look of a decorative exposed brick wall and when done right, it's stunningly beautiful, chic, looks, feels and adds character to your home or swanky Downtown Denver loft. 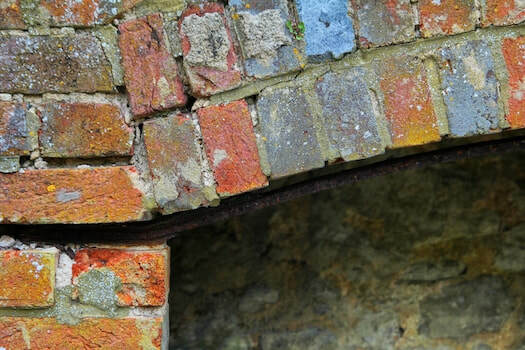 So whether it’s fixing or exposing a brick wall, removing plaster, brick patch, maybe even you're brick garage needs restored or you're in need of some classic historic masonry restoration repair work - we’ve got you’re brick. And you're back! Do your walls in that "creepy" cellar of yours look like this? We do brickwork in Denver, CO that's for darn sure and we're often called out to a brick repairing job after the "cat is out of the sack." Their home or building has wildly started to take a leak or two or three all over the place and the damage is now showing on the inside and that usually means that there is far more substantial damage than what can be seen. If you wait until the problem shows itself, the problem could be a heck of a lot worse than what's showing. This is one of the key differences between a five-star quality brick repair business in Denver CO, and why people decide to call us instead of a fly-by-night company who's just looking for a quick buck, so they can go pound Coors Light with the boys. 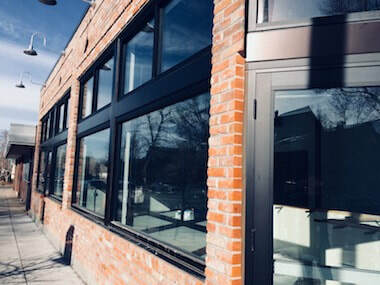 Think of what you have to look forward to once you find the best brick restoration experts in Denver who know the difference because in the end, you're the one who benefits and you don't have to qualify their work every time you need brick repairs. You just want someone who'll handle the job from start to finish and leave you headache free. But it's gotta be flawless. Museum quality. Utterly original, just like it was intended to be. 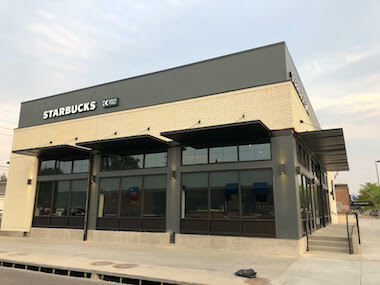 If so... and if you want top-notch brick repair specialist's in the Denver, Colorado metro area... who're cool, easy to work with, best in the business and treat brick restoration like an art form? ​A meeting, walk-through and detailed estimate tailored to your needs. A hassle-free time of your life. Again, just call me personally at (720) 445-9474 to receive all the above, on us. Oh, and if I'm in a slap-happy mood today, we may just through in a lil' something extra. Hint: we will. ​We're excited to show you why we strive to be the best brick repair contractor in Denver, CO. Cornerstone Restoration, Chimney Jack, Denver Masonry LLC, Brothers Brick Restoration, Fessler Masonry, or those guy's on Craigslist, yawn. Look, I'm sure our competitors in and around the Denver, Colorado area all know how to repair or fix a brick wall and they prob'ly do a decent job. Superstar in the making gettn' dirty. ​We work hard to win our reputation. We work just as hard to keep it. Lot's of people all around Denver call us when the mortar between their brick is cracked and corroding away or parts of the mortar joints have been completely destroyed by Colorado's unpredictable rain or snow. Here's the deal: that area of your brick wall needs to be tuck pointed. Tuck pointing is a skill that is not easily mastered; there are many bad examples of piss-poor tuckpointing all across the metro Denver area. It's bad! 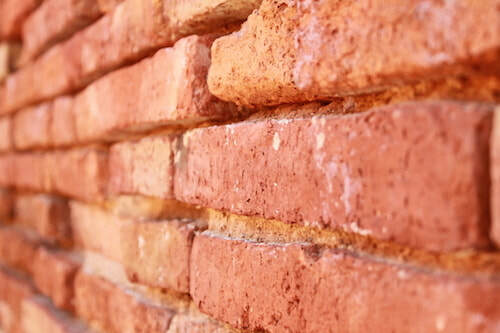 ​When it comes down to Denver brick masonry repair services, knowing how to tuck point and repoint brick especially in richly restored Denver neighborhoods that are never-to-be-forgotten is a job for a brick repair handyman. If you own one of these timeless historic homes in Colorado, then you’ll want to be sure that it’s repaired the right way and shaped by skilled hands. Right? ​Tuckpointing brick is a method used for adding mortar to a joint and it’s not what is usually thought of in the restoration process. Now, there is a pretty big debate amongst the pesky know-it-alls in Denver about the proper definitions, but the correct term for removing a certain amount of brick mortar from a joint and then replacing it with new is actually called repointing which means to repair brick mortar. In simple terms, Denver tuck pointing ( or tuck point) is a process in which two different colors of mortar are used to create an illusion that a fine joint has been formed between the bricks. Basically, that brick color matching mortar fills the joint and the contrasting mortar (thinner line) is added on top. This is a technique requiring the most skilled Denver brick layer. 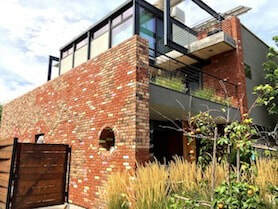 ​​Now Repointing brick in Denver refers to a process of repairing mortar joints. Before any of that brand new mortar can be applied to the brick, the old dirty, deteriorating mortar must first be carefully removed from between the bricks, stone, or blocks with a mortar rake, plugging or air chisel, comb hammers, dogging tools or with this really slick gun-point technology in a way that the surrounding bricks aren't disturbed which can be a pain-in-the-you-know-what if you don't know what you're doin'. Not only does this fancy ol' gun allow ordinary lime mortar to be raked out more effectively, it also allows us to tackle really deep raking and the removal of really hard cement mortar. Although we use it with a vacuum to maximize dust control, there are neighborhoods in Denver where only hand (not power) tools can be utilized and this is where your true skills as a Colorado masonry company will show. 130 year old wall brick wall restoration in need of full refurbishment. If ya don’t have the right brick tuckpointing tools that insure the highest standard of repointing, it can be a slow, sloppy and unpleasant process that’ll make you wanna throw in the (trowel). But even in Denver, the most sophisticated technology is only as good as the person using it. Lastly, Pointing brick refers to the outside part of a mortar joint that is visible; it is the mortar line you see between the bricks, stones, etc. This process is all about applying new mortar, which can be a slow, meticulous effort that requires special skills and lot's of damn patience. We always apply brick mortar mix manually using a few special hand tools: a pointing trowel, a tray, and a slasher, also called a mortar jointer. Are you still awake? Whew! Now, I am pretty sure that some other brick masons will try to bust my balls on this. That’s cool. It'll give me another opportunity to show ‘em who the real brick doctor is here in Denver, CO.
For those large brick wall problems especially exterior brick repair, you definitely need to hire a professional masonry contractor in Denver, Colorado because not only is there the finish but the color which also needs to be matched in as well and matching mortar color is no joke (see how nobody's laughing). Tools of the trade " is only as good as the person using it ". It's a science and takes years to master -- and for Pete's sake, stop watching Youtube videos. You don't see me watching how-to-videos on open heart surgery because I'd rather perform the procedure myself ('cause i'm an el cheapo) rather than hiring a professionaly qualified heart Surgeon who spent half their life in Med school learning their craft, amiright? I'm glad were on the same page. Anyways there ya go, a basic rundown of the Denver tuckpointing and repointing brick procedure. The bottomline: is whether you’re pointing mortar, repairing brick mortar and wondering how to repair mortar between bricks, joints or need brick grout repair done. 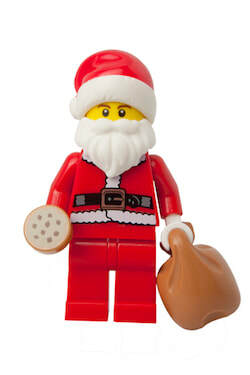 Remember, at Brick Repair Denver: we do all that and more. What you need, when you need it. Whenever and wherever. So unless you know how to point bricks and consider yourself a ninja tuck pointer, hiring a professional for brick repointing in Denver, CO is highly recommended. To avoid disappointment, just call us (720) 445-9474​ with any questions regarding brick tuckpointing joints in Denver's, Mile High City. KAPISHHH! You'd think since we are Denver's masonry repair pro’s, we should be able can fix anything with brick. Amiwrong? It’s true. We can. We will. We love doing it. If you have a fireplace or chimney that is cracked and looks like a complete catastrophe, you have found the best in the business - we can restore the beauty and function back into your Colorado brick chimney or fireplace. Denver historical brick fireplace repair. A poorly repaired chimney in Denver will only make things worse. The proper building of a brick chimney is sadly becoming a dying art and very few residential masonry contractors in Denver, Colorado are qualified to build a safe and efficient brick fireplace from the ground up these days. But once again we got your brick (and back). Besides lightning damage, yep! That’s right. Surprisingly brick chimney’s often get nailed by lightning especially out east of Denver, where the land out that-a-way is as flat as a pancake! Syrup, anyone? 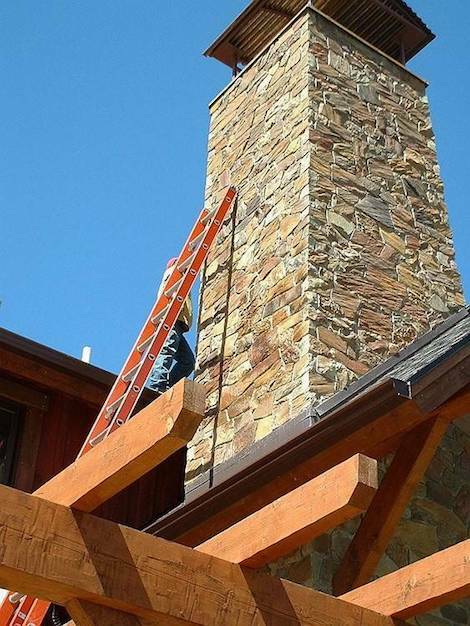 Denver chimney repairs are some of the most common needs when it comes to brick restoration in Denver, CO.
​Other masonry chimney services in Denver we do: tuckpointing or repointing a chimney, chimney liner, cap replacement and flue repair. ​repair expert, early on and when the cost can be reasonable. ​But don’t cut any corners on this one unless you're cool with shelling out lots of bread (and I don’t mean sourdough) down the road. Cha-ching! Brick chimney new masonry construction project on Denver home. ​You’ll want your chimney's brick to always look and remain in tip-top condition especially for Santa Clause to squeeze his chunky-cookie-eating-milk-guzzling-toosh right down that beautiful Denver brick chimney of yours and find the hap, hap, happiest bunch of Coloradans on this side of the Platte River since Bing Crosby tapped dance with Danny-effin'-Kaye! Call (720) 445-9474 so we can do a quick fireplace inspection or chimney repair... or help you with any of the above masonry services here in Denver, CO. When it comes to Denver masonry, a better question is: What don't we do? But here's why most people call us - for brick restoration's and repairing: All types of brick structural repairs, renovation, brick cleaning, masonry sealing and waterproofing, repairing fireplace bricks, chimney restoration, cracked brick wall, cracks, brickpatch, mortar patch, accurate mortar color formulation, texture and finish of any existing mortar, arch reconstruction, brick foundation repair, door and window conversion, exposing brick walls, column, repairing brick steps, garages, brick patio, porch, walkway, mailbox, barbecue, retaining walls, outdoor seating wall new construction and repair, custom concrete work, concrete patching, stone resurfacing, stucco, project consultation… and to get quotes, estimates, repair cost, and prices on all the above. We'll consider anything in Denver County, especially anything in or around Denver, CO, including: Aurora, Littleton, Lakewood, Englewood, Centennial, Greenwood Village, Cherry Hills Village, Wheat Ridge, Federal Heights, Arvada, Broomfield, Superior, Westminster, Northglenn, Commerce City, Thornton, Golden and Boulder. It'll depend on the size and scope of the project, obviously. Contact us and we'll come out for a free estimate. No strings attached. No pressure. No raising the price later on. No gotcha's or B.S.. I Pinky swear. Call (720) 445- 9474 to schedule a day and time that works best. We're not the cheapest masonry contractors, though. That's because our three p's (people, product and process) point and laugh at our competitors'. A great masonry contractor at a fair price is superior to a fair contractor at a great price! ​Whether on the phone or in person, we can explain how saving a few bucks with the other guys can cost you dearly down the road. ( Tuck in your chain 'cause they'll prolly rob you. ) But hopefully your smart enough to not fall down that rabbit hole! Absolutely. We're not just proud of the way our brick repair services look; we'll cover the warranty in simple, straightforward terms when we come out for your free estimate. Call us at (720) 445-9474. Mention Brick Repair Denver for a free quote and don't forget to ask about our special 15% discount offer: to see if you're project is eligible for that kind of a hookup. Oh yeah, and if it's after hours or you're more comfortable emailing, please ﻿use the form﻿ at the top/right of this page. ​P.S. - Contact us anytime day or night. Don't be shy, drop me a line. We look forward to repairing your brick! A TOP-100 FAMILY-OWNED COMPANIES IN COLORADO!